Today’s card is part 3 in my series on the Stampin Up Petal Palette stamp set and Petals & More dies. Each card posted in this series will feature written instructions, measurements and supply list on my blog. 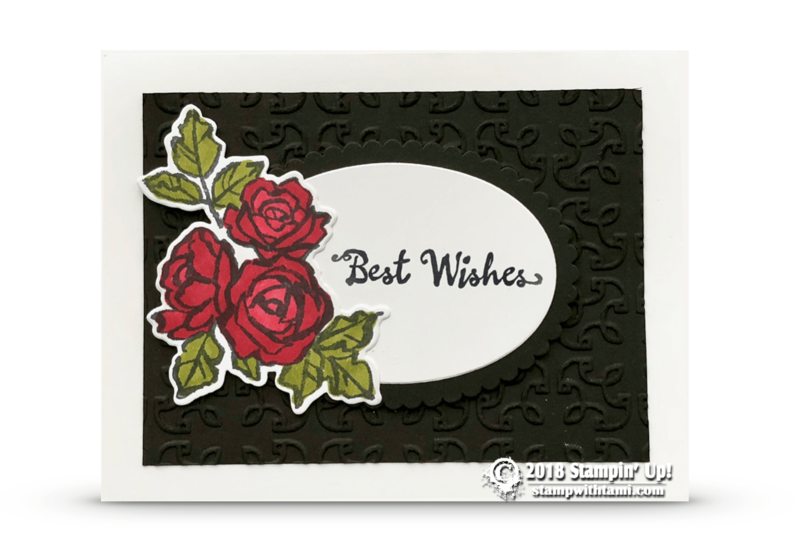 This beautiful card was designed by Terri Gaines.The rose is colored with the new Stampin Blends Alcohol Markers. The background is textured with the Garden Trellis folder. The black, white and red color scheme is striking. It would would for wedding, anniversary, birthday, new house, mother’s day and even Valentine’s day (although I might change out the sentiment for V-day). Using Memento Tuxedo Black ink, stamp the words and flower images on Whisper White Scrap paper. Color the flower with the Stampin Blends markers. (Click here for a video on how Stampin Blends Markers and how to use them). Using the Big Shot Die Cut Machine: Cut the words using the Layering Ovals die, cut a scallop oval frame from basic black scrap. Cut the flowers using the Petals & More dies that match the stamp set. Texture the background with the Garden Trellis folder. Assembly: Assemble the card with Snail Adhesive, using Dimensionals on the oval panel and the flower panel. Measurements: White White Card Base = 8-1/2″ x 5-1/2″, Basic Black Card Stock = 5-1/2″ x 4-1/4″, Scraps of Whisper White and Basic Black for dies. Use this Petal Palette stamp set with (or without) watercolor techniques for unique artistic cards.Combine it with the Petals and More Thinlits dies to create beautiful die-cut petal accents in record time with Thinlits dies and the Big Shot. Save 10% when you purchase them as a bundle.